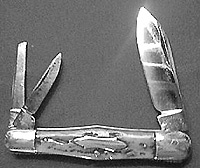 Cattaraugus Cutlery manufactured knives from 1890 to the mid 60′s. 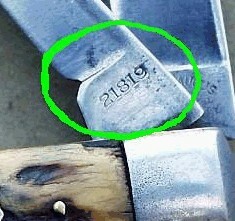 On each knife they stamped a factory pattern number. Click here to Learn about Cattaraugus’ numbering system. This reference guide will list most of the folding knives that were manufactured by Cattaraugus along with descriptions, pictures, and names that the knives go by. 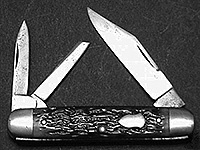 Many Cattaraugus knives share the same pattern number. 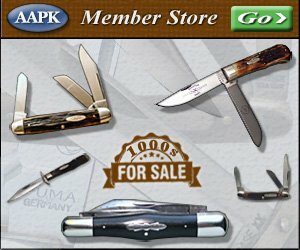 This seems to be the norm on knives that were discontinued before the company went out of business. The pattern numbers that were assigned to a knife that was discontinued was often reassigned to new introduction. 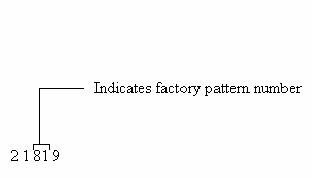 Because of this, we have listed the patterns by their full pattern number rather than by the factory pattern number. Below, you will find some pictures of a few Cattaraugus knife patterns. They are separated by blade count ascending. 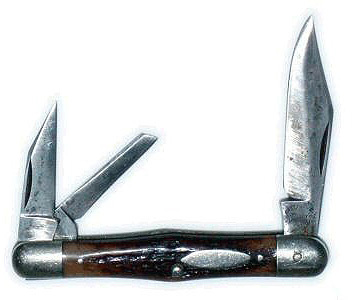 This pattern is a bare-head Jack Knife often referred to as a Hawkbill or Pruner’s knife. They will usually sport wood handle covers. 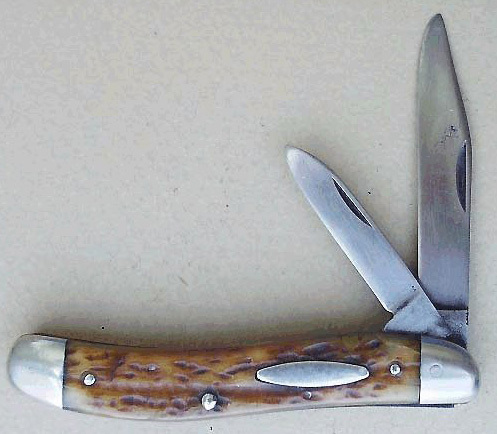 This pattern is a 3 3/8″ single blade bare-head Jack Knife with wood handle covers. This pattern is a 5 1/4″ folding hunter style knife that is often referred to as a “King Of The Woods”. Some have a swing-guard and a lock-back mechanism & some do not. 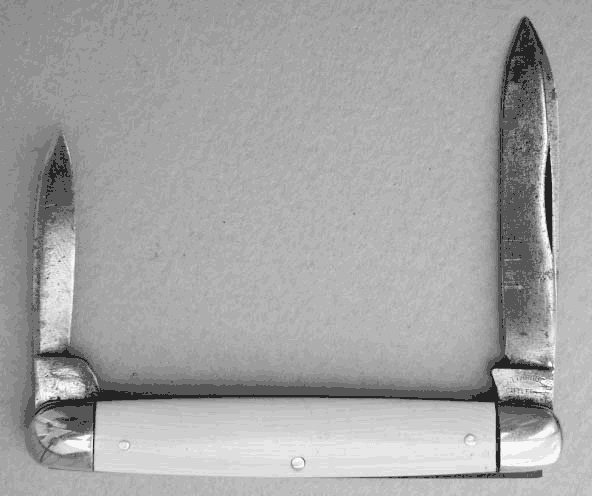 The knife pictured on the left has neither while the one on the right has both. This 21049 pattern is a 4 1/8″ barehead style Jack knife that has a spear and pen blade that extends from the same end. 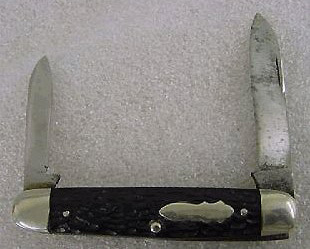 This pattern is a 3 5/8″ two bladed jack knife that is known as an electrician’s knife. They have a spear, and screw driver / wirestripper blade. The screwdriver blade locks open by way of a liner lock. 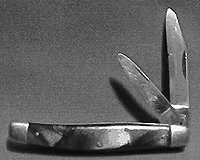 This pattern is a two blade barehead jack knife with a spear and pen blade. 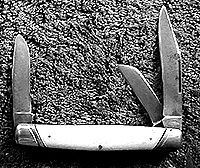 This pattern is a two blade regular barehead jack knife. It measures has a spear and pen blade. 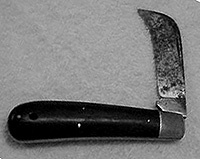 This pattern is a two blade Barlow knife. It measures 3 3/8″ closed and has a clip and pen blade. 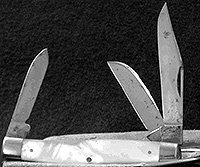 This pattern is a two blade barehead Jack knife. It measures 3 5/8″ closed and has a spear and pen blade. 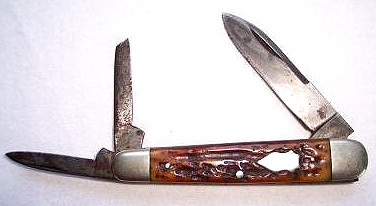 Note that the pictured knife has heavily sharpened blades that no longer have their original shape due to wear. 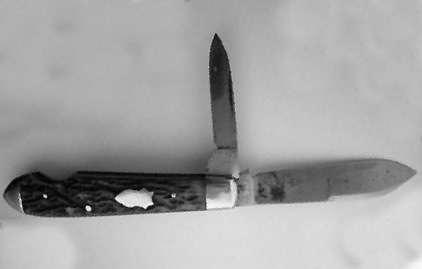 This pattern is a two blade Serpentine Jack knife. It measures 3 1/4″ closed and has a clip and pen blade. 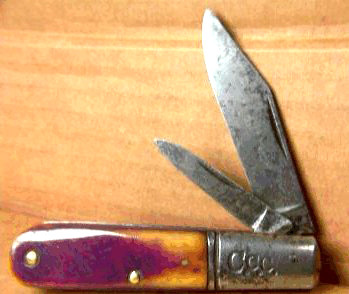 This pattern is a two blade English Jack knife. It measures 4 1/2″ closed and has a spear and pen blade. 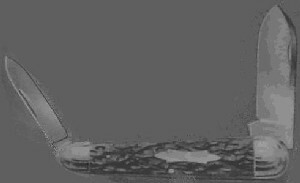 This pattern is a two blade sleeveboard pen knife. It measures 3 3/8″ closed and has a spear and pen blade. This pattern is a two blade swell end Jack knife that features a clip and pen blade. 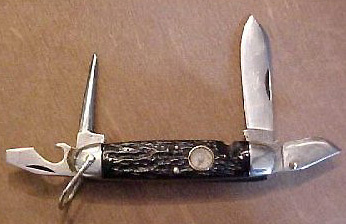 This pattern is a two blade swell center style Jack knife that features a clip and pen blade. It measures 3 3/8″ closed. 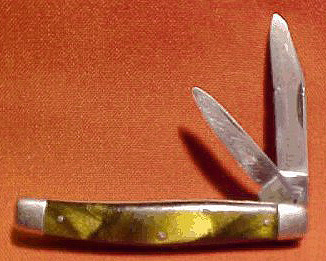 This pattern is a two blade swell center style Jack knife that features a spear and pen blade. It measures 3 1/2″ closed. 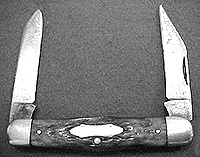 This pattern is a two blade double end Jack knife that is most often refered to as a moose knife. It measures 3 1/2″ closed and features a clip and spay blade. Note that the pictured knife has well worn blades that are no longer in the shape you would find on an unused example. 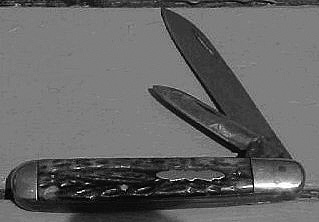 This pattern is a two blade swell end Jack knife that features a clip and pen blade. It measures 3 1/4″ closed. 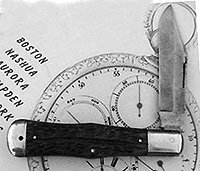 This pattern is a two blade sleeveboard pen knife that features a spear and pen blade. It measures 3 3/8″ closed. This pattern is a two blade serpentine pen knife that features a clip and pen blade. It measures 3″ closed. This pattern is a two blade Jack knife that is most often refered to as a Doctor’s knife or Physician’s knife. 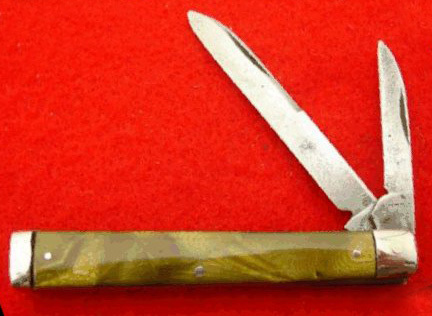 It features a spear and pen blade & measures right around 3″ closed. This pattern is a two blade Jack knife that is most often refered to as a Doctor’s knife or Physician’s knife. 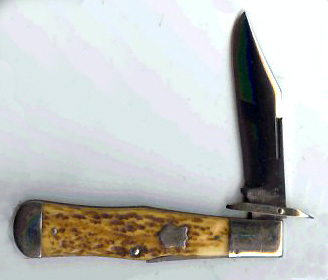 It features a spear and pen blade & measures right around 3″ closed. 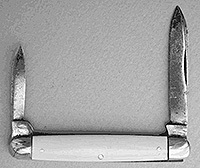 Note that this is the same pattern as the 22754 knife liste above except fot the fact it has bone handle slabs. This pattern is a two blade Jack knife that is most often refered to as an equal end pen or cigar pen knife. 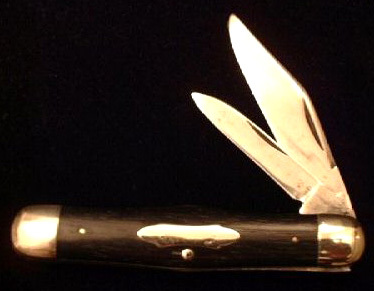 It features a spear and pen blade & measures right around 3″ closed. 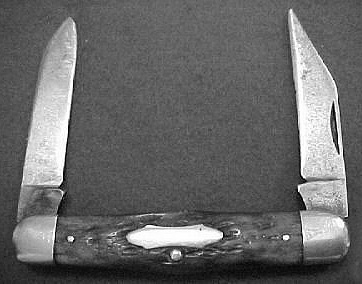 This pattern is a two blade pen knife that is most often refered to as butterbean. 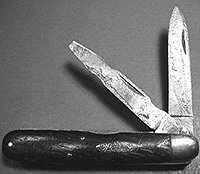 It features a spear and pen blade & measures just over 2 1/2″ closed. 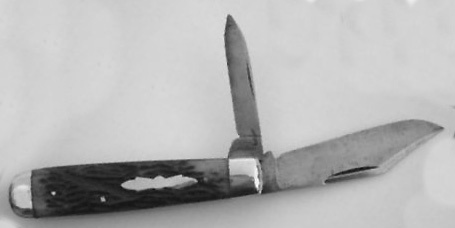 This pattern is a two blade pen knife that is most often refered to an equal end pen. 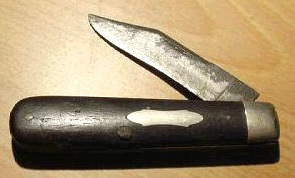 It features a spear and pen blade. 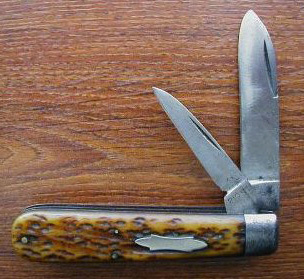 This pattern is a two blade Jack knife that is most often refered to a premium or slim Jack. It measures 3″ closed & features a clip and pen blade. 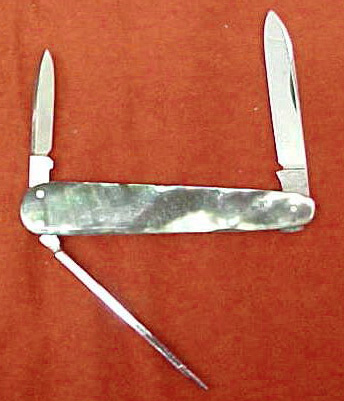 This pattern is a two blade Jack knife that is most often refered to a teardrop Jack. It measures 2 3/4″ closed & features a spear and pen blade. 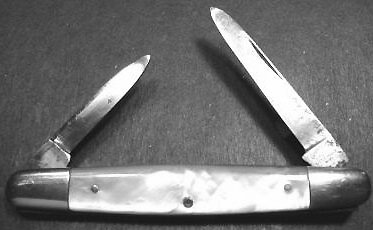 This pattern is a two blade Jack knife that is most often refered to a cigar Jack. It measures 4 1/4″ closed & features a spear and pen blade. This pattern is a two blade double end Jack knife that is most often refered to an Elephant Toenail, sunfish, Pocket Axe, or English Rope Knife. It features a spear and pen blade. 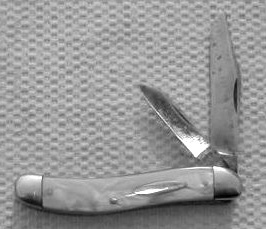 This pattern is a two blade double end Jack knife that is most often refered to a sleeveboard snowshoe. It features a spear and pen blade. 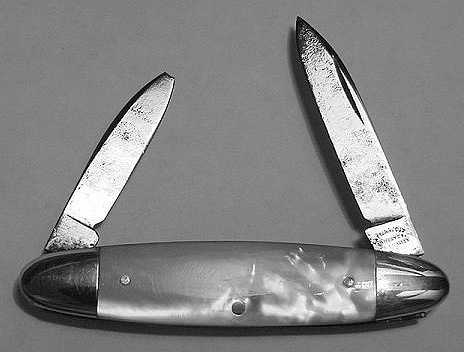 This pattern is a two blade Jack knife that is most often refered to an Easy Open Jack. It features a spear and pen blade. Note the lack of nail pull and cut out in the handle. 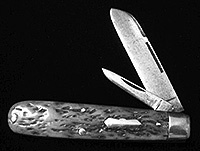 The design is made to enable the blades to be opened by grasping the blade between the operator’s index finger & thumb. 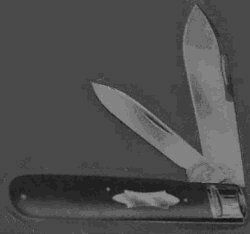 This pattern is a two blade Jack knife that is most often refered to an Easy Open Jack. It measures 2 3/4″ closed & features a spear and pen blade. 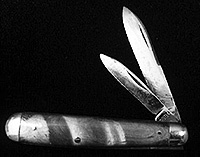 This pattern is a three blade knife that is most often refered to a lobster. It measures 3 1/8″ closed & features a spear, pen, and cutical blade. 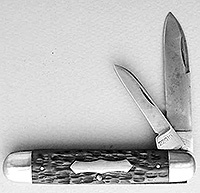 This pattern is a three blade knife that is most often refered to a premium stockman. It measures 3″ closed & features a clip, sheepsfoot & pen blade. 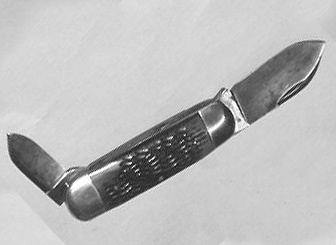 This pattern is a three blade knife that is most often refered to a sleeveboard whittler. It measures 3 3/8″ closed & features a spear, coping & pen blade. 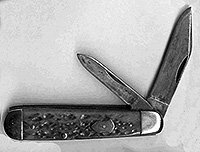 This pattern is a three blade knife that is most often refered to a cigar whittler. It measures 3 3/8″ closed & features a clip point, coping & pen blade. 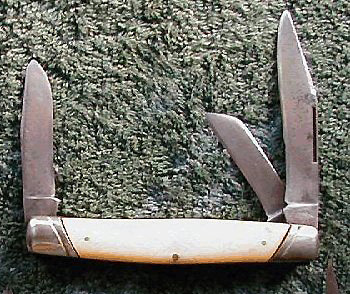 This pattern is a three blade knife that is most often refered to as a swell center whittler. It measures 3 1/2″ closed & features a clip point, coping & pen blade. 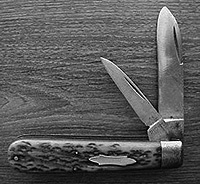 This pattern is a three blade knife that is most often refered to as a gunstock stockman. It features a clip point, spay & sheepsfoot blade. 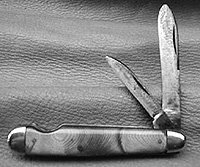 This pattern is a three blade knife that is most often refered to as a swell center whittler. 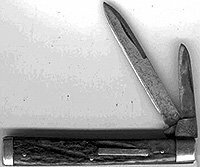 It features a spear, pen & coping blade. This pattern is a three blade knife that is most often refered to as a premium stockman. 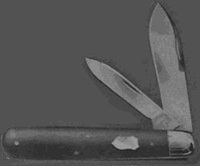 It features a clip point, spay & sheepsfoot blade. This pattern is a 3 3/4″ multi bladed knife known as a scout’s, camper’s, or utility knife. They have a spear, can opener, punch, and short clip. 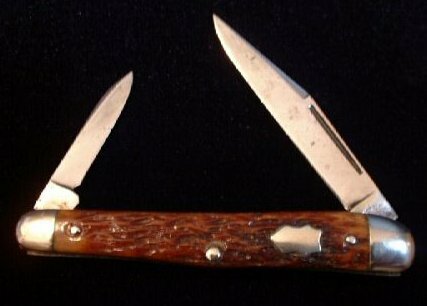 This particular patterrn has bone handles.